In the movies, ghosts are often frightening, bloody and unwelcome and nobody ever wants to get close to them. But in Beijing, with the haunting season just around the corner, some people it seems, can't wait to get ghostly. Take Liu Liming, veteran ghost at Happy Valley theme park's Halloween Bash. The horror movie fan says he was inspired to become a ghost after a visit to a haunted house four years ago. "As my friends and I were about to exit, a ghost jumped out from nowhere. Although we were prepared to be scared, we were still terrified and screamed," he recalls. It made the 28-year-old Beijinger want to be part of the experience. The acting graduate of the Central Academy of Drama landed his job as ghost at the park's Halloween Bash in 2006. He recalls the first time, he dressed up like a mummy and stood still. "When visitors got closer to check me out or tried to take a picture with me, I jumped and made a scary sound," he laughs. "They were really scared and screamed, especially the girls. Sometimes, their screams scared me as well." Now, four years later, Liu plays vampire. "Interaction with the visitors is very important for us. I usually walk around and spring a surprise greeting on them. They are scared at first but then laugh happily. "Sometimes visitors imitate us and try to do the same things to us. But it's difficult to scare us because we're so well trained and we know our surroundings," he adds. Liu usually manages to put a lot of people in panic. Girls wearing Halloween costumes have fun at the park. "One of my most memorable experiences was when I scared a visitor to such an extent that she ran away. Her hat fell off as she fled, so I picked it up and ran after her to return it," he recalls laughing. "But that just made her run even faster!" As a professional actor, Liu also points out that the job allows him to play many characters, which "is perfect for me - what other job lets you play so many roles"? Unlike Liu, Cheng Zhi, a Yunnan native, is a new ghost in the park. He sees dressing up as a ghost as similar to playing a character on stage, which is totally new to him. Instead of scaring people, he says he just wants to experience something that is different from his regular job in the daytime as a clerk at an IT company. Cheng also sees being scared and screaming as a great way to relieve stress, and believes his job can help other people feel the same. "When I sit in the office in a suit and tie, I work like the others, from 9 am to 5 pm," he says. "But when I dress up in a huge skull mask and black cape, I feel relaxed. Although the visitors are strangers, we play and laugh together which feels really good." He agrees with Liu that their task is not just to scare people but ensure they leave the park happy. 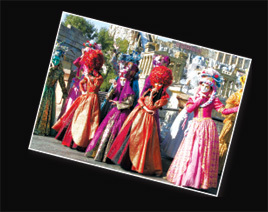 Happy Valley, one of the biggest theme parks in China, is celebrating its fourth Halloween Bash this year together with the Chengdu, Shanghai and Shenzhen branch parks. According to Liang Meixue, from the park's staff, more than 400 ghosts will haunt the park, besides a parade called The Door to Hell Opens, every night during the Halloween season. 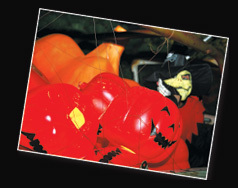 A ghost sitting in a truck with pumpkin heads around him. And if you feel reluctant to drive an hour or so to get to the park, which is located at the east of the South Fourth Ring Road, there are several Halloween options downtown. Costume themed parties, cinemas offering thrilling 3D experiences where ghosts reach out for you from the big screen, and pumpkin head decorations at bars, shops and theaters, are bound to create the Halloween mood. "Halloween gives you a reason to scare people as well as a reason to scream," says Li Jie, an office worker from Beijing who claims to be a party animal. Shops located at popular shopping areas such as Xidan and Nanluoguxiang are doing brisk business selling Halloween trivia and costumes. So are online shops. According to one of the shops in Xidan, more people are going in for glittering headbands and animal ears and tails instead of full costumes. Bloody vampire teeth are also popular among young people, because they are less expensive and easy to wear. 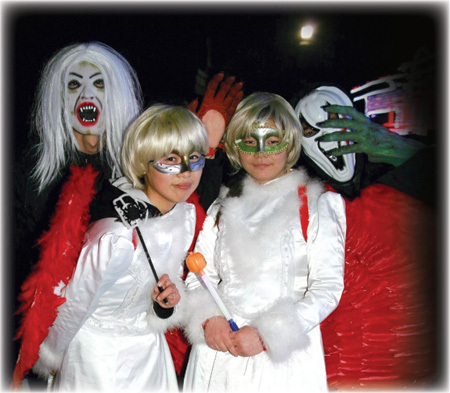 Scary masks and costumes, like those with eyeballs hanging out or a knife plunged into the head, are another hot favorite with youngsters. "Young people like to dress up as prisoners, superheroes, pirates and doctors," the shop says. Some families even dress up their pets as pumpkins and the red spider-web witch, or as movie-inspired characters such as Transformers and Shrek. "There is something for everyone during Halloween. So why not have fun?" says Li.